As indicated, for offer is my Aquatimer on titanium bracket as well as rubber strap. The strap was sized to fit my 7" wrist and there are no additional links for the bracelet. I bought this second hand from Govberg Jewelers in 2013, and I had a full IWC service completed in 2016. I rate the piece as TZ excellent condition running as it should, and it will come in a IWC service case with the paperwork I have from when I purchased it originally. Price is $3200 plus shipping cost. 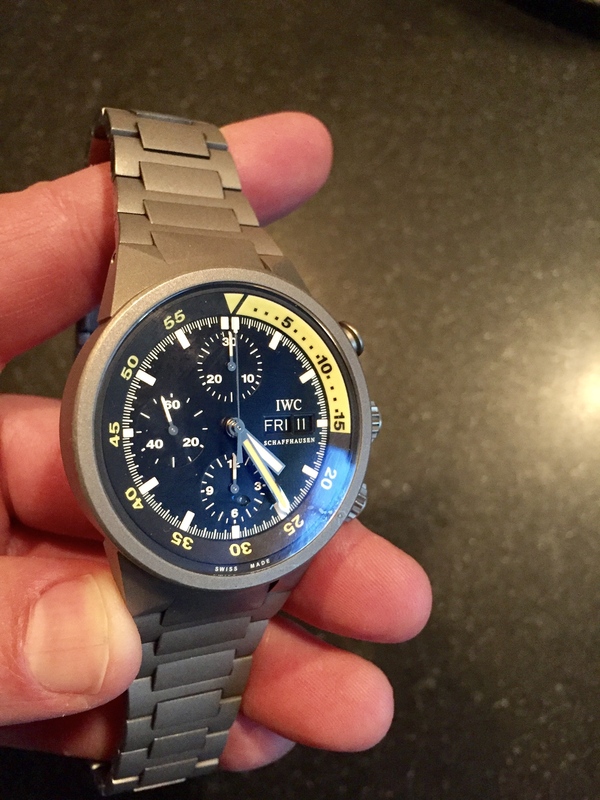 Trades considered are IWC GMTs (preferably UTC on pyramid bracelet or Worldtimer), Omega Speedmaster or GMT complication, and Breitling Cosmonaut. Others could be considered too. Obviously cash differential will be paid in instances that require it. Bradwkelly@yahoo.com for additional picture or questions.